Shape Layer is equivalent to CAShapeLayer class in QuartzCore framework. The most common type of layers is shape. There are varieties of shape layers included in QuartzCode. These are: rectangle, rounded rectangle, oval, polygon and star. In addition, vector and pencil tool are also of type shape layers. The shape shares common properties in Layer Inspector. Oval, rounded rect, polygon, and star have few extra options. For oval shape, you can specify start angle and end angle to create arc shape. 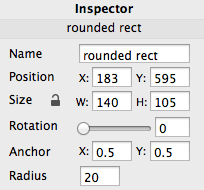 For rounded rect shape, you can change it’s corner radius. 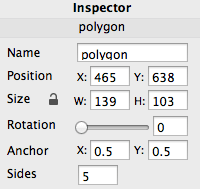 For polygon shape, you can change it’s sides count. 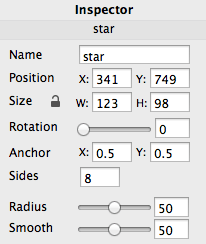 For star shape, you can change it’s sides count, radius of each side and the smoothness of the sides.